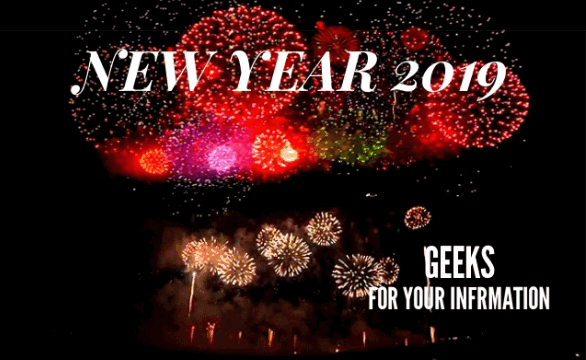 Ashampoo Burning Studio 20 New Year 2019 Giveaway! We would like to thank Ashampoo Development GmbH & Co. KG. The new Ashampoo Burning Studio 20 is the new update of Ashampoo Software's line of disc burning software! It is a powerful disc burning software that burns data, movies and music to CD, DVD and Blu-ray discs. Ashampoo Burning Studio 20 is efficiently versatile even with simple tasks of burning data to CD/DVD/Blu-ray discs. With disc spanning data is spread automatically across multiple discs and scratch protection ensures readability even for damaged discs. The software also comes with various multimedia features that let users create, edit and burn their own movie and slideshow discs. Multimedia capabilities include custom animated menus and designs, opening and closing credits as well as auto-play for nearly endless possibilities. Resulting files and discs are playable on almost any device thanks to built-in support for popular formats like MPEG-4, H.264, AAC, MP3 and WMA. Not only does the program also create MP3 and standard audio discs but also supports disc-ripping with automatic track naming and cover search. The integrated cover editor has been redesigned to make it even more easy to create custom covers, booklets and inlays or disc labels. Ashampoo Burning Studio 20 also provides an elegant solution to create and browse disc images in common formats like ISO, CUE/BIN or ASHDISC complete with handy image previews. Ashampoo Burning Studio 20's backup section has been overhauled and now features smart backup plans with support for multiple device categories like cellphones, tablets, MP3 players and more. The car radio module has also been updated and now comes with built-in support for 1,600 different models and multi-disc player emulators. The new improved backup manager efficiently manages your data, provides a quick view of existing backups/updates plus it even reminds you when its time for a backup. To boost forum participation/contribution, all who wish to participate MUST have created a minimum of 3 threads and 5 posts (giveaway/contests are not included). WE WILL BE CHECKING! 1. Please answer the question below. of Ashampoo Burning Studio 20?" Post your reply as contest entry WITH your social media share. Please see sample entry below. 2. REQUIRED: Please share this giveaway by pasting the code below in your Facebook/Twitter/Google+ Account. Optional: You may want to like/follow Ashampoo's social networking sites as added support. Only one entry per member is allowed. Dual entries will both be deleted and user will be banned from giveaway so please be careful. winners will only have 5 days to send a PM to claim their prize. Please include your details (Name / Email) in your PM claim. NO CONFIRMATION FOR THOSE WITH INSUFFICIENT/INCOMPLETE DETAILS. 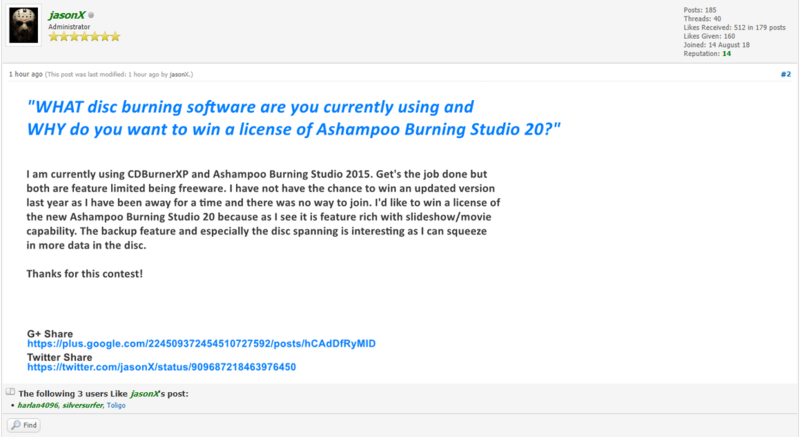 "WHAT disc burning software are you currently using and WHY do you want to win a license of Ashampoo Burning Studio 20?" I am using ImageBurn (since ages) and the new Ashampoo Burning Studio 2019 but the features of the full suite is really most welcome to any user. The ability to cut and edit movies from the program itself is helpful and not need for me to go out of he program and use video editor. Good if you do simple edits! Thanks for contest! Thanks Ashampoo! I am currently using "BurnAware free." Ashampoo Burning Studio continues to be among the top reviewed disk burning software by users and critics across the web. ...Fast, reliable, and time proved. *I especially like the feature that allows the user to burn "password protected" disks. Thank you geeks.fyi forum, the ashampoo.com team, and jasonX for this contests. Currently, for DVD recording I use a program BurnAware Free and the program copes well with recording CD, DVD and Blu-ray discs. However, it has limitations in its functionality. I want to get Ashampoo Burning Studio 20 because this program has advanced features. I especially need features such as video with animated menus, creating slideshows, protecting discs from scratches. And it really is an all-in-one program. Thanks again @jasonX and Ashampoo for this amazing contest. I'm using PowerISO 6.4 for burning CDs and DVDs but it's limited in burning features and mainly used for mounting images as a virtual drive. With a dedicated burning and feature-rich software like Ashampoo Burning Studio 20 Professional, I can easily copy CDs, DVDs and Blu-ray discs and burn movies and photos to disc with animated menus and photo slideshows. It can also make comprehensive backups with scheduler, encryption and password-protection and scratch protection. Count me in! I am currently using CDBurnerXP, which is used to burn CDs and DVDs. In addition to basic functions such as burning data CDs, audio files and MP3 files, the program creates and records ISO. I would like to win Ashampoo Burning Studio 20 to have a wider program and be able to record in a more advanced way the creation and editing of films, protection against scratches or car sound, the ability to save projects. 1. WHAT disc burning software are you currently using and WHY do you want to win a license of Ashampoo Burning Studio 20? I do not have any disc burning software at present. Ashampoo Burning Studio 20 can help me burn data, movies and music to CD, DVD and blu-ray discs. It can create, edit, burn slideshow discs browse images in popular formats and backup your data, updates with reminds when its time for a backup. With such favorite features, I am anxious to win this license and have a test of it. I am currently using ashampoo burning studio 19 and would love to use version 20 with improved features, performance and reliability. CONTEST HAS ENDED. WINNERS TO BE ANNOUNCED LATER. PLEASE BE PATIENT. Current time: 19 April 19, 21:04 Powered By MyBB, © 2002-2019 MyBB Group.